Now known internationally for its fresh mountain air, year-round pleasant temperatures, and large community of North American expats, Boquete has changed rapidly since the start of the century, changing from a humble mountain town, into a humble mountain surrounded by gated communities and estates. 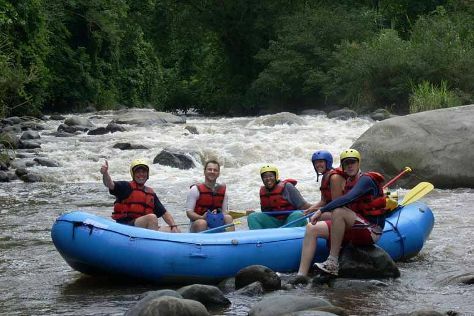 Start off your visit on the 29th (Sun): relax and rejuvenate at some of the top local wellness centers, relax and float downstream with Chiriqui River Rafting, then savor a delicious cup with a coffee and tea tour, and finally take in the dramatic natural features at Los Ladrillos. Get ready for a full day of sightseeing on the next day: trek along Sendero Los Quetzales (The Quetzales Trail), then take in the dramatic scenery at The Lost Waterfalls-Boquete, and then browse the collection at Biblioteca de Boquete. Plan my day in Boquete using traveler tips and tourist information provided by Inspirock. Wrap up your sightseeing on the 30th (Mon) early enough to travel back home.